One of the roads affected by recent sinkholes in Monaghan has reopened today, a month after the subsidence appeared. The R179 regional road from Carrickmacross to Kingscourt reopened to traffic this afternoon. Geological and hyrdrological testing has been carried out on the site over the last four weeks by an independent consultants commissioned by the Department of Communications, Climate Action and Environment. The firms involved, Gyproc Ireland Ltd and SRK Consultants, "consider that it is safe to re-open" the road. But the LP4900 local road to Drumgossat will remain closed until further notice, said a spokesperson for Monaghan County Council. "Further testing and analysis of ground conditions in the vicinity of the LP4900 local road will continue over the coming days and this road will remain closed," said the spokesperson. A revised one-way system is in place for local traffic wishing to access Drumgossat school and church. 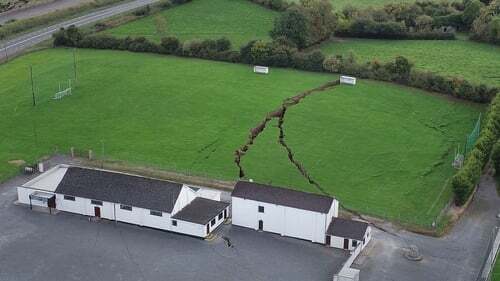 Sinkholes appeared in the land on September 25 and 26, the result of a mine collapse.The subsidence caused damage to a local GAA club, and properties and roads nearby were tested to see if they were at risk. Is there a sinkhole coming to a field near you?